Want to add value today? 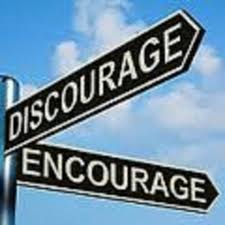 Find a discouraged person and encourage them. Discouraged people are—how can I say this…discouraging. They are no good to themselves or no one else. They drain the life from the room, the project, the effort. In most cases discouraged people are not bad people they’re just empty of courage. Don’t make it so hard to add value. There are no new continents to discover nor planets (and you probably don’t have a telescope anyway); you’re probably not be the one to come up with the next new blockbuster app or technological breakthrough (through don’t sell yourself short); but there is one thing you can do that will give an immediate return—insert encouragement into every conversation and interaction you have with people today. The return is immediate and oh so easy if only we’d get our attention off “stuff” and self and on helping others. Tags: Encouragement. Bookmark the permalink.